Not every counter top water filter being sold is created equal! These counter top water filters are actually made in USA and superior in quality to other similar looking counter top water filters yet are available at an attractive price. Just select one of our premium carbon block filter cartridges and these home water filters will drastically improve water quality and purify ordinary tap water into clean and delicious purified water for all your drinking and cooking needs. Garden Hose Drinking Water Filter - High Pressure Design. UV Counter Top Water Filter Complete: $165. Click on the images above to see the detailed descriptions for each home water filter. Easily attaches to a sink's water faucet in seconds. Greatly improves water quality and removes chemical contaminants. Makes nasty chlorinated tap water look and taste like bottled drinking water. These are really high quality filter systems with Stainless Steel water spout. There is no "internet surprise" with these. The most economical residential water purifier of all the high performance systems. Premium quality engineering and materials. These units last almost forever. An excellent portable water filter for travelers. Premium carbon block filter cartridges are selected by YOU - so you can have a choice. We recommend the Matrikx +1 or Matrikx CR1 cartridge if you have trouble deciding and don't have a Lead problem. Replacement cartridges cost about $16 -$18 and typically purify water for 10-12 months. Pays for itself quickly. Replaces bottled water which costs $10-$20 a week . Filter home water for pennies. Fits 90% of all faucets without needing a faucet adapter. We include 2 different faucet adapters for free in your order to make sure you will have no trouble hooking things up. 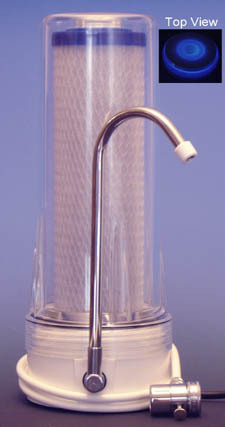 For even higher levels of filtration see our double counter top water filter. Premium quality engineering and materials. Compression fittings on all tubing are proof of superior engineering. Water spout is food grade stainless steel with a double o-ring seal. Unbreakable elbow fittings (at the base) are lead-free brass, not plastic. Diverter valve is made of lead-free brass and engineered to last. a gift that says “I care about you”. Not every counter top water filter being sold is created equal! This Double Stage residential water purifier is actually superior in quality to other similar systems yet is available at a more attractive price. Even better than a Single Stage filter system because it allows you to use either 2 different water filter cartridges to remove a wider variety of additional contaminants, or 2 of the same for maximum filtration performance. This unit will greatly improve water clarity and also improve water quality of extra nasty tap water (with 2 carbon blocks) into clear and delicious purified water for all your drinking and cooking needs. A top quality high performance residential water purifier. Instantly attaches to a sink's water faucet in seconds. Purify water even better than a Single Stage water filter with 2 carbon block water filter cartridges for super performance. Recommended for heavy odors or more contaminated drinking water. You can create powerful combinations of water filter cartridges, or use 2 of the same. CALL US for help! Allows you to place a sediment filter (well sediment filter) in front of the carbon block to protect it against premature clogging from heavy sediments. These are really high quality with Stainless Steel water spout. There is no "internet surprise" with these. The 2nd most economical high performance residential water purifier. Pays for itself quickly. Replaces bottled water which costs $10-$20 a week or more. Filter home water for pennies. Premium water filter cartridges are sold separately so you can choose. Our water filter replacement cartridges cost about $18. and purify water typically for up to one whole year! Fits 90% of all faucets without needing a commonly available faucet adapter, but we include 2 different faucet adapters for free in your order to make sure you will have no trouble hooking things up. For even higher levels of chemical filtration, see our Triple Under Sink Filters. Purchase a set of 2 filter cartridges and your system is 100% complete and ready to ship. We recommend a Matrikx +1 cartridge followed by a Matrikx PB1 , Matrikx CR1 or Pentek CBR2-10R cartridge if you have trouble deciding. Includes Housing, UV disinfecting lamp and Carbon block filter. Complete with cartridge! (Item UVCB) You must use this one only. and as a gift that says “I care about you”. 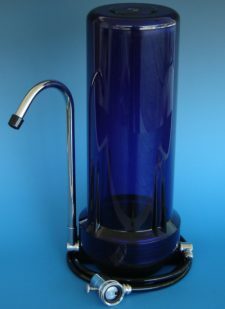 Finally a high quality (made in USA) Countertop UV Water Filter. This countertop UV water filter adds the power of UV Disinfection of Water to the technology of 0.5 micron carbon block filtration. Comes Complete with a high performance ½ micron carbon block water filter to drastically improve water quality and improve water clarity before bombarding cysts, bacteria, and virus with disinfecting Ultra Violet rays. The easiest and most economical UV water filter we sell. Clear housing provides visual verification that the UV Lamp is working. UV Lamp provides 10 watts of UV disinfection power 24 hours a day. Fact: 10 watts x 24 hours per day @ 10cents per kilowatt = 2.4 cents per day. UV Lamp is rated for 9000 hours (375 days). Replace once a year for only $29. UV Lamp ultra violet wavelength is 234 nanometers. Effective for disinfection. Designed for potable water only. Disinfection occurs at a standard flow rate of ½ gallons per minute or slower. Special ½ micron (Nominal) carbon block water filter cartridge comes INCLUDED and is very high capacity. Carbon block capacity: Reduces Chlorine, Taste, and Odors for 10,000 gallons or 1 year. Greatly improve water quality and remove chlorine and chemical contaminants. This is really high quality with Stainless Steel water spout. There is no "internet surprise" with this. For even greater performance you may replace the lamp and carbon filter every 9-10 months, if desired. Portable UV water purification for travelers and vacationers. For higher levels of UV sterilization (17 watts) see our economical JaneroPure UV Systems. Not recommended for high sediment, high turbidity, or infectious waters. See our High Power (17 watt) UV Systems. This system is 100% complete and ready to ship. Cartridge is included. It is much more economical in shipping costs to order the yearly Replacement UV Lamp and carbon block filter now instead of later. If you order any optional accessories now, they will be added to the box and ship for pennies instead of dollars. 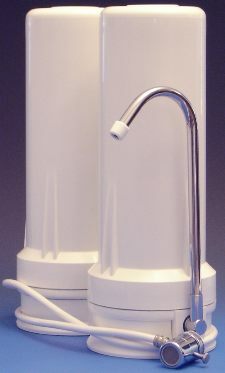 This unique [countertop] drinking water filtration system features a high pressure filter housing and all premium grade components. Use for situations where you are not equipped with a standard sink faucet, but have access to a standard garden hose or garden hose faucet that delivers potable drinking water. Designed for industrial shops, outdoor events, travelers, construction crews, athletic teams, campers, barns, garages, backyards, and houses that have a standard 3/4” garden faucet as the water supply. Heavy duty high pressure housing unit accepts operating pressures up to 75 PSI. 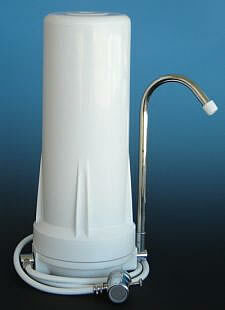 This unit is several times stronger than a standard countertop water filter. Comes with a solid brass standard ¾ inch garden faucet/hose adapter that easily attaches to any 3/4" male garden hose threads. Has a 6 foot high pressure hose for convenient placement. Features a built in On / Off valve for easy use. Optional Filtamate 85 PSI Pressure Regulating Valve is available to help protect against over-pressure. 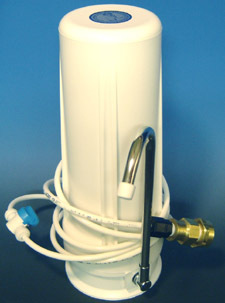 We will install this for you.Recommended for water supplies over 75 PSI. High purity faucet is 100% stainless Steel! Installs in seconds. Completely portable. Uses any standard 10” carbon block filter cartridges for excellent water quality. Filter Cartridges sold separately so you can choose the one that best suits your water quality. Call us at 210-568-3628 if you need any assistance. This filter works REALLY well! Do not expose to UV rays, direct sunlight, or chemical solvents. Use for potable (safe) cold drinking water only, not for hot water use. Order your filter cartridge separately. Enjoy the CB10S. Multi-Contaminant Home Water Filter System - Complete with Cartridges. Looking for a super performance counter top home water filter system with hassle-free 30 second installation? This COMPLETE system is effective against: Lead, Mercury, Cysts, VOC solvents, MTBE, chlorine, chlorine byproducts, pesticides, herbicides, asbestos, particulates, and thousands of organic contaminants. This system is designed to drastically reduce these pollutants, when present, in potable (safe) drinking water - when reverse osmosis is not an option. Reverse Osmosis works even better and removes inorganic contaminants such as nitrates and toxic metals, but is much more costly, larger, is ruined by hard water and iron, and requires a water pressure of at least 55 PSI to operate. If your water is contaminated you should first consider reverse osmosis as the superior technology. Does not require a plumber to install. Moves with you if you ever move or go on vacation. Requires only about 12-16 PSI of line pressure to operate. a premium 2 Stage Countertop Water Filter with a stainless steel water spout, and the filter cartridges already installed for you. Attaches to your faucet in a matter of seconds. 99.95% of Cysts such as Cryptosporidium, Giardia, Entamoeba, and Toxoplasma organisms. MTBE (common gasoline additive / groundwater contaminant) for 500 gallons. The Pentek CBR2-10R also contains a special 0.6 GPM flow-rate control device that ensures the critical flowrate needed for the filter media to perform efficiently. Replace the Pentek CBR2-10R cartridge after every 500 gallons of use or sooner. Estimate your daily water usage and mark your calendar. Replace the MultiPure CB10S cartridge after every 500 gallons of use or sooner. Estimate your daily water usage and mark your calendar. This filter work REALLY well and produces exceptionally clean, clear, tasteless water. Pays for itself quickly. Replaces bottled water which costs $10-$20 a week or more. Young children, infants, and fetuses in pregnant women are particularly vulnerable to Lead poisoning from lead in drinking water even from a small dose. Growing children will absorb any lead they consume more rapidly. A child’s physical and mental development can be irreversibly stunted by over-exposure to lead. In infants, whose diet consists of liquids made with water, such as baby formula, lead in drinking water make up 40 – 60 % of total lead exposure. For young children it is estimated that lead in drinking water contributes between 10 – 20 % of total lead exposure. It is well known amongst scientists that developing children and unborn fetuses in pregnant women are quite vulnerable to Mercury. Mercury in water is neurotoxic and can cause developmental disorders when present in drinking water. Chlorinated VOCs such as the extremely common Trichloroethylene, Perchloroethylene, and hundreds of other solvents are absolutely legendary for producing devastating birth defects in babies such as leukemia, lymphomas, spina bifida, anencephaly, cleft lip, cleft palate, small birth weight, spontaneous abortions, pre-term birth, etc. etc. in pregnant women who unknowingly consumed these pollutants every time they drank their kitchen tap water. There is NO debate on this. This is fact. Cysts are chlorine resistant microorganisms that cause serious illness and sometimes death in immunocompromised patients, babies, the sick, and the elderly. Famous waterborne outbreaks often occur from cysts such as Cryptosporidium, Giardia, Entamoeba, and Toxoplasma. These chemicals are not good for all people and can contribute to disease, especially over a lifetime of consumption. If you don't want to estimate your daily water consumption in gallons you can install a $38 Digital Flow Meter with Alarm to count the number of gallons filtered. Eliminates all guesswork and ensures maximum purification levels by keeping your cartridges fresh.